Marie and Pierre Curie started the new discipline of radioactivity. Attempts to understand this strange and puzzling phenomenon and the source of energy in radioactive decays engendered the field of Nuclear Physics. Marie Curie and other pioneers like Ernest Rutherford worked and studied naturally occurring radioactivity but nobody was thinking about producing new radioactive nuclides not found in nature - producing artificial radioactive elements. This would really be a "Holy Grail". Already natural radioisotopes had shown their effectiveness in medicine, chemistry and research. Artificially produced radioisotopes would be a game changer. This is exactly what Irene and Frederic Joliot-Curies achieved and were immediately recognized by the award of the 1935 Nobel Prize in chemistry. Their journey to stardom was not without setbacks and they missed two certain opportunities of being the first to make groundbreaking discoveries which earned Chadwick (discovery of the neutron) and Anderson (discovery of the positron) the 1935 and 1936 Nobel awards respectively. Irene and Frederic were two very different personalities. Irene grew in the shadow of her mother Marie Curie. She developed an intuitive feeling about radioactivity, went to Stockholm in 1911 for the Nobel award ceremony, accompanied Marie Curie during her American trip where they received a charmed welcome. Irene had helped Marie during the first world war with X-ray work saving lives of thousands of soldiers and joining the Radium Institute to work on her doctorate to study the radiation from polonium-210. Irene was cut-out for achieving great things - she was intelligent, head strong and very hard working. Frederic, three years younger than Irene, came from an engineering background and in December 1924 when he was hired by Marie Curie, Fred was doing national service, had no serious physics qualifications. Frederic was a gregarious and outgoing young man who found Irene somewhat enigmatic. 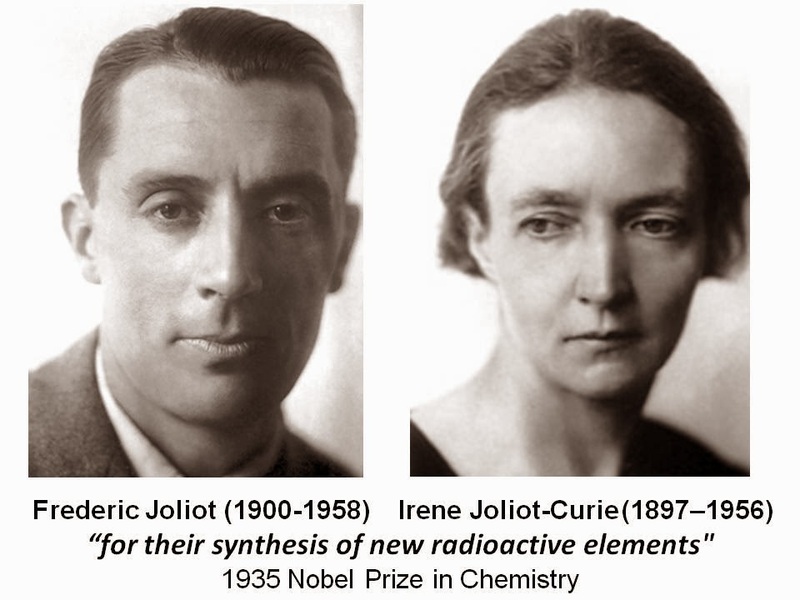 They soon started to like each other and despite Marie Curie's serious reservations, got married in October 1926 and adopted the name Joliot-Curie. Irene and Frederic made a great team. They were immensely helped by having strong alpha particle fluxes from the polonium source that Marie curie had collected at the Radium Institute. Frederic also turned out to be very good with instruments and had sensitive detectors like ionisation chambers and cloud chambers for detecting particles. 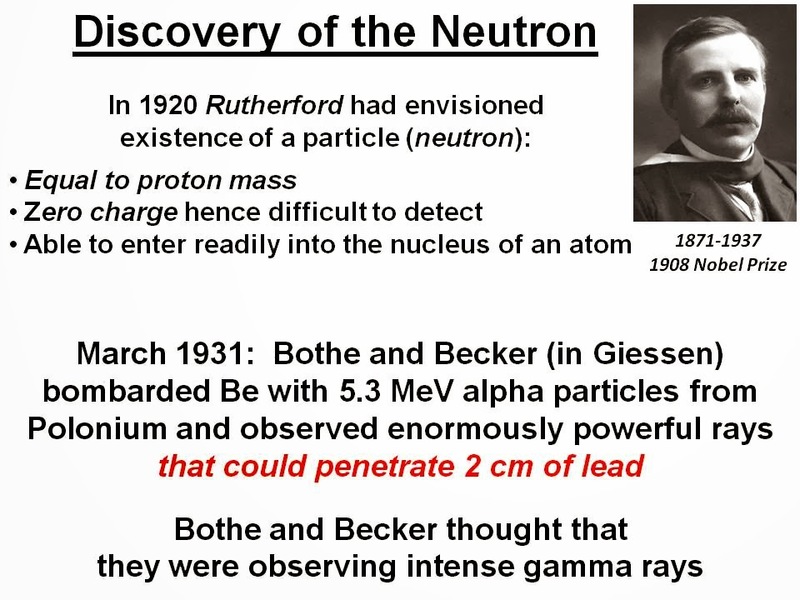 Chadwick concluded that Bothe-Becker radiation consisted not of gamma rays but of neutral particles of the same mass as the proton, i.e., neutrons. 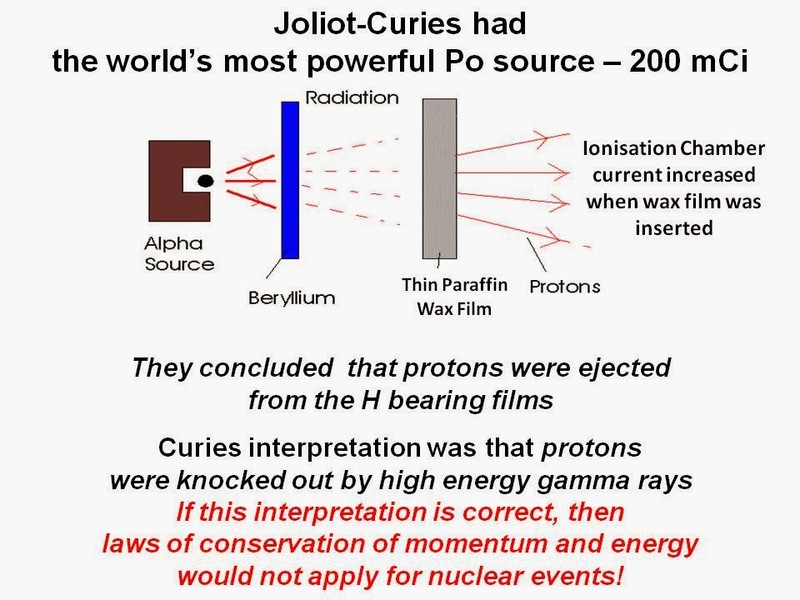 Joliot-Curies had done the right experiment but their interpretation robbed them of being the first to discover the neutron. Joliot Curies had a very sensitive cloud chamber. During their studies of cosmic rays, they observed positron tracks in their films. They interpreted the positron tracks as due to negative electrons which had been scatterd in the backward direction. This is a picture of one of the first positron tracks observed by Anderson in 1933. It was taken in a cloud chamber in the presence of a magnetic field of 2.4 Tesla pointing into the paper (so the particle paths are curved to the left). The cloud chamber (17x17x3 cm) contained a gas supersaturated with water vapour. In the presence of a charged particle (such as a positron), the water vapour condenses into droplets - these droplets mark out the path of the particle. Carl Anderson won the 1936 Nobel Prize for Physics for this discovery. Picture taken from C.D. Anderson, Physical Review 43, 491 (1933). Yet again Irene and Frederic missed the opportunity to get credit for their pioneering experiments in the observation of the fission of uranium. Irene and Frederic had strong views about atomic weapons, peace, women's rights and had overt communist leanings. Their views lost them favour with the politicians and to some extent with the scientific establishment, particularly in France. of the French Atomic Energy Commission. His task was to make France a world leader in the nuclear industry. Irène became not only a commissioner but also the director of the Radium Institute. But the Joliot-Curies' political activities led to their downfall. In spring 1942 Fred had secretly joined the French Communist party, at that time a leading anti-Nazi force. Although Irène never became a member, she sympathized with many movements in which French Communists took a lead, including support of equal rights for French women. At the height of the Cold War, Fred was dismissed from his position at the French Atomic Energy Commission. A few months later Irène also lost her post as commissioner.